It’s always hard to leave hotel beds, especially when we each have one to ourselves. We went downstairs for breakfast but then hopped back in bed to watch “World’s Wildest Police Videos” until check out time, whereupon we moved down to the lobby and dithered on what to do. The plan was to hike, of course. Then Stretch moved to the computer to take care of a few things and I realized there was a huge coincidence happening: wineries in the area and rental cars in the area. We tried to get a rental car but they only had bigger, more expensive vehicles left on the lot, so we scrapped that idea. 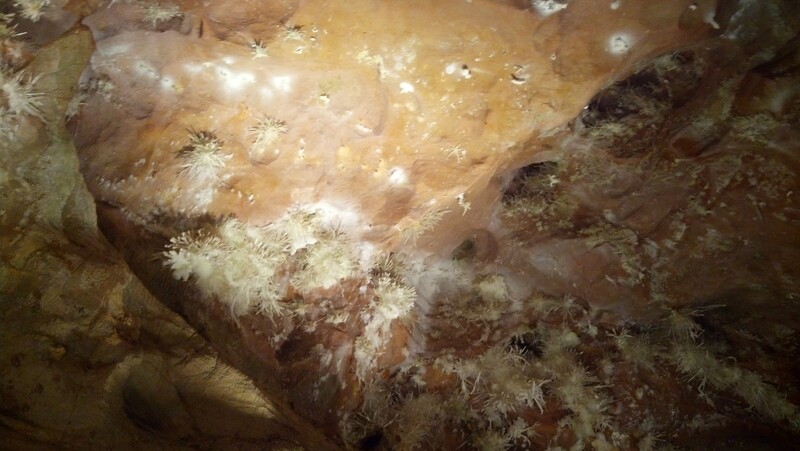 I talked to Greg, a friend in the area, about what to do and he suggested Skyline Caverns. The caverns were only a couple of miles away so we decided to hitch to that for the afternoon. Then it started torrentially down pouring, which is not a good circumstance to get a hitch in, so we sat some more before getting Thai food for lunch at the restaurant in the hotel. It had stopped raining by the time we were done eating and we got a ride down the road easily. 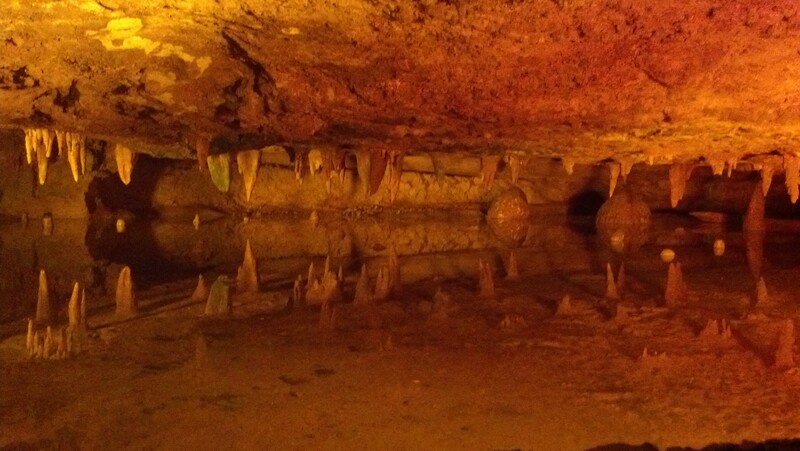 The caverns were really neat to walk through and they featured anthodites, a crystal found in only a few other places in the world. We had about a one hour walking tour through before heading back to town. We hung out at the park until Greg arrived after work then grabbed some fantastic pizza and ice cream before heading back to the hotel for the night.